Hear excerpts of "The Rite of Spring" in conductor Valery Gergiev's thrilling performance with the Kirov Orchestra. Igor Stravinsky's ballet The Rite of Spring (Le Sacre du Printemps) is often held up as a masterwork that changed modern music forever. Music commentator Miles Hoffman takes the distinction one step further. "The Rite of Spring," Hoffman says, "represents one of the greatest creative leaps in not only the history of music, but in the history of the arts." Stravinsky's music is famous for causing a riot at its premiere. It was a warm spring evening in Paris on May 29, 1913, and Hoffman says the well-heeled crowd at the Champs Élysées Theatre was not ready for jagged rhythms, crunching discord, and the strange jerking of the dancers on stage. "The ballet was choreographed by the great Nijinsky," Hoffman says, "and the noise, fighting, and shouting in the audience got so loud, he had to shout out the numbers to the dancers so that they knew what they were supposed to do." One shrewd musicologist wrote that "the pagans on stage made pagans of the audience." Hoffman says that the idea of pagans is right on the mark. "The subtitle of The Rite of Spring," Hoffman says, "is 'Pictures of Pagan Russia,' a celebration of pagan rituals that eventually leads to a sacrifice of a chosen young woman to propitiate the gods of spring. It's not what you call a happy tale." The shock of the new, in 1913, quickly gave way to a warm embrace. More performances of The Rite of Spring followed close on the heels of that famous first night, and by the 1920s, it was played in the U.S. In the 1940s, the infamous piece gained a permanent place in pop culture when Walt Disney used part of it as the soundtrack to Fantasia. Today, The Rite of Spring remains a classic, but it also still packs a punch. "It's a shocking piece," Hoffman says. "It's still startling to us today when we hear it, but it is not a confusing piece. It's compelling. We're hearing irregular rhythms, we're hearing instruments asked to go to the extremes of their capability, but we're also hearing patterns that we recognize, with pacing, contrast, fascinating harmonies, continuity — all the basic principles of what makes a piece of music work are all there. And that shows us the secret of Stravinsky's genius." The Rite of Spring also opened doors to countless possibilities for future composers. "It liberated many composers," Hoffman says, "and there were many imitators. 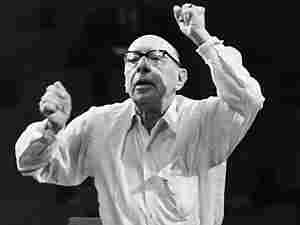 I don't think you can listen to modern movie music without sooner or later hearing the influence of Stravinsky and the Rite. "I like to think of this piece as a celebration of creativity, period. A new music is born, and sometimes births are violent."